Get your tickets today at exclusive savings to see Carrot Top in 2019 when you book your tickets in advance! Rates start at just $44 before taxes and fees. 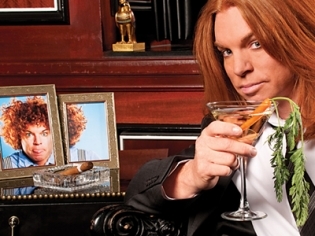 Save up to $12 on tickets to see Carrot Top at the Luxor - General Seating. Rates start at just $46/ticket before taxes and fees. Carrot Top is an outrageous and hilariously funny personality. You never know what he's going to do in this unique show. 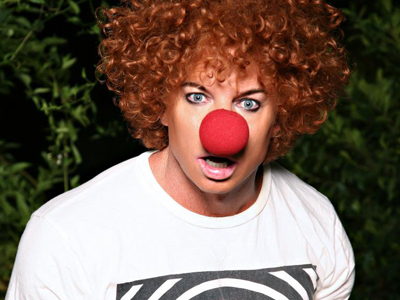 Book your tickets to see Carrot Top now and get Insider only pricing! Rates start at $48/ticket before taxes/fees. Get tickets to see Carrot Top at Luxor here today. Ticket rates start at $50 before taxes and fees. Although sometimes pigeonholed as a “prop comic,” Carrot Top’s arsenal of humor expands much further than the wildly imaginative creations that he uses to fuel his jokes. 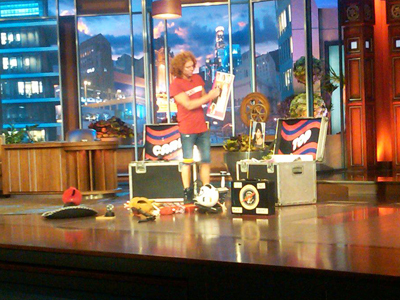 His experience and comfort on stage is immediately realized when seeing Carrot Top perform live. During this hour-and-a-half performance, Carrot Top offers an endless supply of witty commentary on everything from celebrities to current events and even Las Vegas tourists. When you take a look at Carrot Top walking out onto the stage, his huge personality is immediately preceded by his wild, red hair and stand-out, tie-dyed attire. His comedy is on par with his image in that it is upfront and in-your-face without apology. 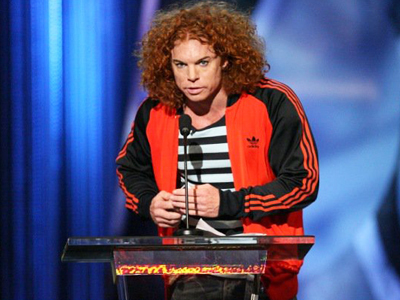 Carrot Top pulls no punches when it comes to the topics that he addresses or the people that he ridicules. He delivers jokes in lightning-fast fashion, sometimes without much order that still manages to work perfectly with his never-tiring personality. He is often offering crazy stories while simultaneously running back and forth to find his next goofy and creative prop. Carrot Top does a wonderful job of keeping audiences engaged in his performance throughout the show, and rewards each one with side-splitting humor that will leave them exiting the theater with lingering abdominal pain from the non-stop hilarity. Carrot Top is insanely funny he had us laughing from the beginning to the end! He definitely is Vegas! Who else brings you a shot in the middle of his act? Carrot Top that?s who! Thanks for the Crown Royal! If your thinking about going trust me GET TICKETS NOW! What a wonderful show! Couldn’t have had more fun, great price also. Watched Carrot Top last night and he put on a hell of a show! Had us laughing the whole time! Definitely worth the money. He even handed out shots of Crown Royal to audience members. End of the show was the best when he mimics several rock bands! A must see!!! I couldn’t stop laughing the entire show! His interactions with the audience were hilarious! I really didn’t want the show to end. You have to see this show if you love comedy. Carrot top rules. He is still just as funny as ever. It is a must see. Worth every cent and a must see! Admittedly I was hesitant but if you want to have an hilarious and fun filled evening, this is a must see. Every second was entertaining. Fortunately he gives you a bit of a breather part way before he ramps it up again. My face now hurts as much as my feet. From start to finish my wife and I had a blast. I was laughing so hard tears were rolling down my face for the whole show. Carrot Top did an awesome blend of props and video visuals that were just simply brilliant. Thanks for the great time Carrot Top, I’d recommend this to anyone hands down. Great show, so funny, crying i was laughing so hard. A show I would want to see every time I go to Vegas I would highly recommend going you won’t regret it. So so much fun!!!!! Remember to check in your back pack down stairs though… Not allowed in theater but you dont know that until u get upstairs! Laughed for 90 minutes straight. Carrot Top is a fun non-stop ride that keeps you in stitches with each and every prop that comes out of the trunk. Worth the trip! Carrot Top knows how to put on a show. He has so much charisma and personality! I laughed so hard! There was no waiting for a punchline with him every word out of his mouth is funny! He has such a knack for props and improve it is amazing. A great show to see! Chris angel was good but this show was worth every penny. Completely awesome. Recommend to everyone!!! Had me on the floor. I honestly laughed out loud the entire show! I loved that it was adult humor. I would definitely go back to watch him again! Absolutely my favorite show in Vegas. I’ve seen him every time that I have been to Vegas and will see him again next time I visit. Non stop laughter and keeps material up to date. Highly recommend everyone go see him. I was reluctant to go at first but after reading all the good reviews I took a chance. This was by far the best money spent on an excellent show. Non stop laughing from start to finish. Go, you will not regret it!!! Laughed from start to finish! Thoroughly entertaining. I also talked my husband into going. We enjoyed the show so much. This is not the Carrot Top from many years ago. He was a well seasoned comedian who is current and included jokes anyone ages 21-75 could relate to. We are still laughing about the jokes today. We told others at the gaming tables today to check it out. Wish he would tour and come to Atlanta Ga where our friends could also see the show. Me and my fiancee had a blast. We laughed the entire time. We can’t wait to go back, well worth it. I have never enjoyed Stand Up/Comedy shows – they just always come across as trying too hard, but Carrot Top’s show was great – just be aware that its crude humor so if you are easily offended then don’t go. I would love to see him again! Best show ever- my husband and I saw him a few years ago- and just saw him again holy crap- We cried we were laughing so hard – take the time out of your trip to see Carrot Top- you will not be disappointed. I went to see Carrot Top last year in Vegas and it was the best fifty bucks I have spent in a long time. Within the first minute everyone was laughing. If you want to leave a show with a smile on your face. This is the show to see. 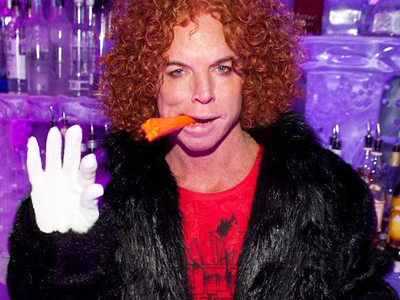 Carrot Top still has it! I was always a fan of Carrot Top when we was on tv. His Vegas act is 10x better than anything I ever saw on tv. His props are still funny. His act was a lot more adult than I expected. I wouldnt take anyone under 18. Not a family show at all. I laughed the whole show! My cheeks still hurt! I had to drag my spouse to this show, he was not at all looking forward to a comedian. Well the show was better than we both expected. My husband laughed and laughed. Just when I did not think the act would get funnier, it did. The whole theater was laughing. CT is our new favorite comedian. Carrot Top was the funniest show ever! I was laughing so hard, I was crying at one point. His quick humor makes a great night out. His show will not disappoint! I saw Carrot Top years and years ago in Vegas and thought his act was hilarious then. I went recently and his act is even better! I have never laughed so much before. I didnt think it was possible, but he is still one of the best acts out there!